The man responsible for content management and business model strategy development at NTT DoCoMo says he wants an evolution, not a revolution. Mission Impossible For Broadband Providers? Japan is witnessing a "rash" -- as one NTT exec puts it -- of broadband upstarts. But do any of these challengers stand a chance against NTT? It's been a year since Nasdaq Japan and 18 months since Mothers launched. They were supposed to help high-tech startups go public and raise money. Are they doing what they were designed to do? One of Japan's largest newspapers is trying an interesting online publishing experiment. Wireless newspaper delivery to your home -- anywhere in your home. An oasis of free, fast Net access hopes to draw in the coffee-sipping masses -- and demo the latest in desktops, notebooks, and ISP offerings. The "five hot startups" we picked in September 2000 turned out to be, well, hot. And the high-tech sushi joint we covered in March has added a new touch. In April we told you about Japan's wireless P2P scene, which could lead to a new kind of person-to-person network. The idea is catching on. Which i-Appli apps are popular? The urbane author of A Hundred Samurai Companies discusses the state of financial journalism and the role of small and medium-sized companies in the Japanese economy. The CEO of FreeBit.com aims to make the free ISP business model a profitable one. 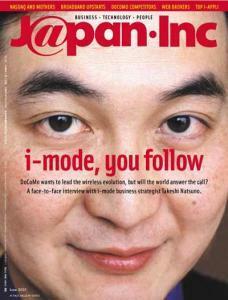 This month: The entrepreneurial stigma; Xbox vs. PS2; B2C e-com growth; the keitai generation; Asian wireless subscribers. Attitudes are hardening toward foreign workers in Japan. More Japanese than ever are trading online, and despite the market downturn, Web brokers are booming. But how many will survive? Fifteen million happy non-DoCoMo users can't all be wrong. Ventures we're keeping an eye on: Video News Network, Enfour, ImaHima. An Osaka-based outdoor goods vendor gets more than just nibbles on its site. Graphic designer Hajime Tachibana has chosen a strange new canvas for his latest works: the cellphone screen. Enough with the cellphones already! And turn down that vending machine!